For decades, Bill Genovese had many questions about the tragic death of his sister Kitty, whose murder in the streets of New York had become a sensation after the New York Times reported that there were 38 witnesses to her attack in the apartments above who resisted a temptation to help. In piecing together what happened apart from the established record, he couldn’t have found a more ideal partner than filmmaker James Solomon. “I’m not exactly sure why, but somehow I’ve been doing these iconic American stories we think we know,” said Solomon, who previously wrote scripts for the Robert Redford-directed “The Conspirator,” an investigation of the little-known prosecution of Mary Surratt as part of the Lincoln assassination, and “The Bronx is Burning,” a chronicle of the rambunctious New York Yankees teams of the 1970s that was emblematic of a city on the verge of chaos. Though “The Witness” is Solomon’s first documentary, the screenwriter-turned-director couldn’t have written anything more suspenseful than what he and Genovese find in “The Witness,” which somehow simultaneously revives Kitty, a fiercely independent and effervescent barmaid, in vivid fashion, showing just what Bill and his family lost when she was killed in Kew Gardens, and questions the legacy her murder left behind, beginning with the coverage of death that implicated the community around her. Drawing on good old shoe-leather reporting, as well as evocative avant garde animation that conveys spatial and emotional distance in gripping fashion, “The Witness” allows an audience to come to terms with Kitty’s death at the same pace as Bill does, with the complexity of issues ranging from the media’s thirst for provocative headlines and the erosion of historical records connected to these events giving way to a dramatic yet simply human resolution. 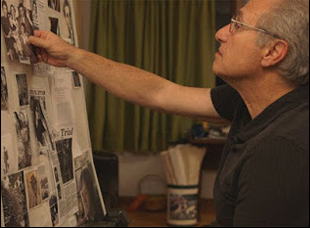 As “The Witness” makes its way to theaters around the country, Solomon spoke about how he became interested in Genovese and his 11-year investigation with Bill to make the film, as well as why he was inspired to use animation to help tell the story and why the film is best seen with an audience. I pitched a scripted project to HBO with Joe Berlinger, a wonderful filmmaker who did “Paradise Lost,” and Alfred Uhry, the great screenwriter who wrote “Driving Miss Daisy,” and in the course of researching this scripted project, I met some of the people who had a connection to the story, which has been transformative in that it helped inspire the 911 emergency system, neighborhood watch groups, and Good Samaritan laws. None of them had been heard from in decades. I met Bill Genovese, and was immediately struck by two things – one, that Bill brings Kitty to life. Kitty is only known to all of us by the last 30 minutes of her life. You meet Bill, he’s 12 years younger than Kitty and despite the age, they were the closest of the five Genovese siblings. Bill describes her in the movie as both a mother and a father to him, and when you meet Bill, you meet Kitty. She becomes a vibrant human being. The other thing I learned very early on from Bill was that it wasn’t just the loss of his sister that had transformed his life, but the story that we’ve all come to know. He said to me, “I needed to prove that I would not only have been someone who would have opened the window that night, but would have gone down into the street.” That has shaped his entire life, literally and figuratively, and nothing came of the HBO project, but I maintained contact with Bill. In 2004, the New York Times decided to write a 40th anniversary piece on Kitty’s murder and in that article, they began to question the accuracy of the original account. Bill was determined to find out for himself what actually happened that night and it’s taken 11 years to get made, but I followed him as he pursued multiple mysteries – what happened that night, how did that iconic story come to be, who was his sister Kitty, and why this person, Winston Moseley, who is in jail and confessed to it, did he do it? Did you consider this a partnership with Bill as opposed to a filmmaker-and-subject relationship? The film chronicles Bill’s investigation, and you’re a filmmaker, and you’re present, and people don’t normally have conversations on film, so there is an element where you’re in collaboration, but it was driven by Bill. But there is no question that even an autobiographical film creates its own life. For example, Bill and I would talk about who he wanted to speak with, who he wanted to meet, and he had a wide net. He wanted to talk to anyone who knew Kitty in life or through her death, and was still alive, so finding out who are those people – the jurors, the guys who worked at the bar with Kitty, we found [together]. Then there’s a process of arranging the meeting. Not one email or letter that invoked Bill’s name was ever sent by me without Bill reading it first. Bill would draft his questions for the people we would meet and send them to me and I would send questions to him – there’s an intimate relationship. The film is so personal that we, over the course of an 11-year period, were constantly within their home, and I announce at the front of the film that it’s a film by James Solomon, so the audience is under no delusion that they think they’re seeing Bill directing himself, but it’s also Bill narrating his own story, so the challenge of the film was to get out of the way of Bill to let him tell the story as it happened, rather than to impose myself on that story. Though it’s all of high quality, you can tell this was shot over a number of years based on the different look of the footage. Did you shoot some footage at first and then take a break before pursuing further? The film unfolds, generally speaking, chronologically. There was a period during filming that we stopped for a couple reasons. It’s not covered in the film, but Bill had a medical illness in the middle of filming that necessitated that we stop, and then my brother, John, who was my only sibling – the person I looked up to more than anyone – got sick with leukemia during filming, and died two years later, [which is] important to note because I started off making a film about a brother who lost his sister, having no understanding of sibling loss personally, and then in the course of making this film, I experienced my own loss, and that only deepened my understanding of Bill’s. You bring a style to the film – a continuing visual motif of looking into windows, apart from the crime, and I wondered whether it was interesting to mix the instincts you perhaps developed as a screenwriter into making a non-fiction film? In many respects, the film is about perception and false narratives, and how the stories we tell ourselves, whether in the middle of night or across 50 years, shape our lives even if they didn’t really happen, but we told ourselves they did. A lot of it is how life is seen through filters that we all have. Making a film like this, you learn that a crime multiple people witnessed, whether they heard or saw, is as much about the witnesses themselves, as what actually happened. Everything is filtered through our own experience, through our own hopes. People in the apartments that night were hoping it wasn’t what they thought it might be, so they didn’t have to get involved. Or a son of a killer tells himself a story about what his father did and why in order to justify his father’s actions, otherwise, it could be too difficult to actually live with that reality. I had a wonderful cinematographer, Trish Gavoni, who shot every frame in the film, and in talking about it, we had a sense that a lot of this was through filters — the film is about Kitty Genovese, but you feel this presence of Kitty through following Bill — and from the filmmaking standpoint, it wasn’t always by design, but there are quite a number of windows that I was often aware as if Kitty was there. The animation is quite effective because of that same feeling — the way that you can express distance since there are layers to it. How did you choose that style of animation? Conceptually, there was a lot of information that Bill gathers, and the challenge then became how to visualize that information. By his own design, Bill uses whiteboards to document his voluminous, “Serial”-like investigation, so that motif informed the animation in part. Reality and truth is often a line, not a fully formed idea. It’s a sketched concept. So I did not want fully formed animation. I was looking for something that felt more impressionistic, almost as if it were pieces, not the whole, so I scoured the internet. I looked for animators who were working with an impressionistic style, and I happened upon this extraordinary student film that a young woman had made in the UK. It was featured on Vimeo and I just wrote her cold, and asked her. Out of that came a collaboration. I’m also very drawn to the artist Robert Rauschenberg’s collages, and the layering of text, image, and drawings, so the work that he did in that era informed the artistic choice as well. That’s why you’ll see as a kind of collage these images of text and crime photos, in combination with these wonderful drawings, [which was] the remarkable work by a group of animators in the UK called The Moth Collective. Although there’s always been media organizations that have sensationalized the news to sell papers, this seems to mark a particularly low point that in turn lowered the bar. Was that always as prominent a part of this film as it ended up being? It isn’t a condemnation of journalism, not the slightest bit. It is a celebration of one man’s dogged determination to find the truth and what one man is capable of doing. There’s a story we all know, and that story is that 38 people watched for a half-hour as a woman was attacked and not helped. The story just isn’t true and it shaped a lot of people’s lives, no one more personally than Bill Genovese. What Bill does in the film is unravel that story. You start with the premise that there’s this story, but you don’t know where the unraveling is going to take you, and the film isn’t just about whether there were or weren’t 38 witnesses. What he’s doing in the film is reclaiming Kitty’s life from her death for, not the public, but for himself, and his family. That’s what’s so poignant about what he’s doing. The sensationalization was responsible for not only erasing Kitty’s life to all of us, but within Kitty’s own family. Those older brothers said, “It was so hard. We just erased her from our lives.” That’s where you start. You start with the impact of this story, and then when you begin to realize the story has serious flaws, including that Kitty actually died in the arms of a friend — she wasn’t left alone — you begin to question all the stories you’re telling yourself, and you want to check your own stories. There’s a journalism expression, some stories are too good to check, and that’s what Bill did — check the story. What’s it been like getting this out into the world after living with it for so long? We were very private about the making of the film so that Bill could advance at his own pace, so you’re used to being just a tiny little group, and then, as you say, when you share it with others, it’s been overwhelming. The response has been stunning. The Q & As have been longer than the film itself and what’s interesting is, no matter the age or the background, or the experience, or the awareness of who Kitty Genovese was, audiences are taking different things from the film. For some, it’s a fascinating “Serial”-like mystery. For others, it speaks to notions of loss. To others, they question their own stories. Others are fascinated by the media. It plays on multiple levels, and that is thrilling. You never know what’s going to happen. When you’re making a film, you hope you can convey it, but viewers are getting the film, and particularly in communal experiences. Watching this film has been really, really surprising, because of what happens and how people want to talk about it. Somebody said to me, “I haven’t seen that kind of conversation take place since I saw ‘Capturing the Friedmans,’ and everyone wanted to talk about it.” That’s been really gratifying. “The Witness” is now open in limited release. A full list of theaters and dates is here. Frameline '16 Interview: Jonah Markowitz on Charting the Groundwork for Gay Marriage in "Political Animals"
Interview: Natalie Kottke Masocco & Erica Sardarian on Bringing Health Back to "Company Town"